Two years ago at the Cannes Yachting Festival and the Southampton Boat Show, Princess Yachts promised a revolution – to be even more successful as a business, to excel in relationships with customers, employees, distributors and shareholders, and to launch innovative and beautiful new products that would be game-changers in the industry. With the global launch of the Princess R35 – the world’s first performance sports yacht – Princess is delivering on that promise and re-defining what is possible in design, innovation, materials engineering, and quality in motor yachts. Antony Sheriff, Executive Chairman, Princess Yachts said: “Innovation is key to our aggressive growth and investment plan, and the R35 defines innovation. It features the revolutionary use of a world-first active foiling system, aerodynamics inspired by the performance road car and Formula 1 industries, and is the world’s first volume sports yacht fully constructed from carbon fibre. Combined, these deliver enormous performance gains across comfort, predictability, usability and efficiency at a wide range of speeds. And a unique experience on the water for pilot and passengers. As with all Princess’s yachts, virtually all the R35 components are designed and crafted at the company’s six facilities in Plymouth, where recruitment has been accelerated to record numbers to cope with unprecedented demand – Princess expects to build a record number of yachts in 2018, cementing its position as the world’s leading brand of luxury yachts and a major contributor to the UK economy. Crucially, Princess is working closely with world leaders in design and on-water performance. Ben Ainslie Racing Technologies has supported the technical revolution with its America’s Cup racing know-how and aerodynamic experience provided by ex-Formula 1 engineers at its Portsmouth headquarters. And legendary Italian automotive styling house, Pininfarina SpA, is working in collaboration with the Princess Design Studio. The result is a uniquely fast, dynamic, beautiful and elegant yacht. 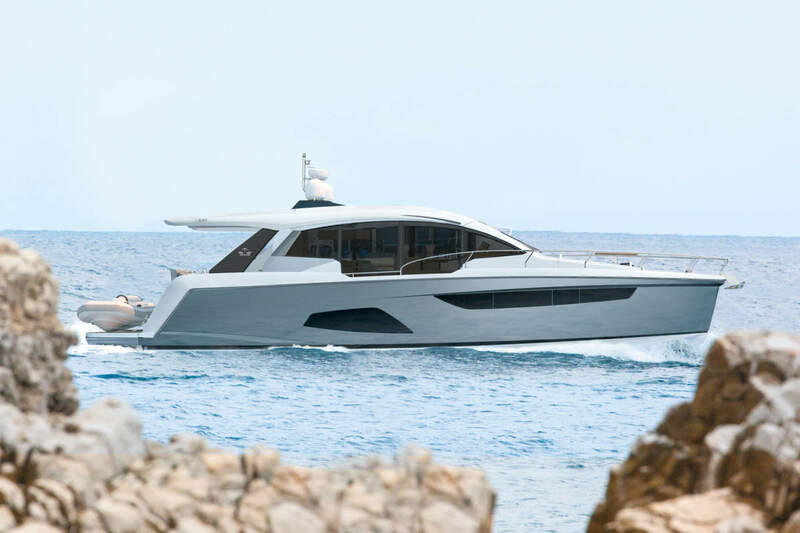 · Princess R35: The use of carbon fibre for the boat’s construction saves 500 kg in hull weight – or 20 per cent of the hull’s overall weight – compared to traditional materials used in competitor sports yachts. · Financial: Princess Yachts delivered a record-breaking year in 2017, with its highest ever sales, a robust return to profitability, and advance orders totalling more than US$1 billion (£¾ billion). · Product launches: Princess has launched seven new yachts this year. In 2019 and 2020, Princess plans to launch a combined 15 yachts. To put that into context, Princess launched four combined over 2014 and 2015, and ten combined over 2016 and 2017. · Employment: Princess’s workforce has increased by 850 in the past 12 months, bringing the total to almost 3,000 – a record level of employment for the company. As a result, Princess is investing heavily to train her craftswomen and craftsmen to ensure delivery of the ambitious sales targets and superior levels of quality that define the brand. Princess has also strengthened its Apprenticeship scheme and welcomed 40 new learners to the business this month. · Economy: Princess has one of the most interesting manufacturing stories to tell in the UK and represents genuine value to the UK economy, with over 90% of Princess’s yachts exported to customers around the world. True to the company’s motto of Crafted in Plymouth, over 80% of each yacht (excluding engines, glass and navigation) is manufactured by hand by Princess in the city. The R35 has all the makings of a perfect revolution, in all aspects, we consider the R35 to be one of, if not, the best eye catching piece of design from the Plymouth outfit, long may it continue.